Matus Lasut was by all accounts a simple man. From the age of five, when his mother died, he’d learned to bear hardships as a normal part of life. He grew up tending cows, often sleeping with them in the barn on a bed of straw. His family needed his back, not his brain, to survive so his formal education was limited to just the winter months. His real education took place in his work, where he learned to scratch out a living in the rocky soils of northwestern Slovakia. During the years of violent transition that his country went through – from an independent Czechoslovakian nation to a Nazi puppet state to a Communist satellite of the Soviets – Matus always worked the land. He labored quietly as a woodcutter until he was promoted to the respectable position of forest ranger by the local government. His faith was simple also. Without a mother to instruct him, he had nevertheless learned the basics of being Catholic. He knew the Our Father and the Hail Mary and he understood a few points of the catechism. He followed the Church’s requirements regarding his marriage and the baptism of his children but he wasn’t so fervent when it came to Mass and confession and communion, not to mention charity for his fellow men. He didn’t particularly like many people but the ones he disliked he made certain they knew it. His faith wasn’t lacking so much as it was lazy. Yet Matus retained throughout his life an aspect that was characteristic of all Slovakians regardless of status, a second-natured devotion to Mary. Matus went on to describe her as having folded hands and wearing a crown of twelve stars. Her hair fell over her shoulders from beneath a gold-edged veil of white that stretched to her feet. A blue girdle, also edged with gold, cinched her snowy-white dress. On each foot rested a rose of gold. Hanging over her right arm was a rosary that reached to her knees – white beads for the Aves and gold ones for the Paters. 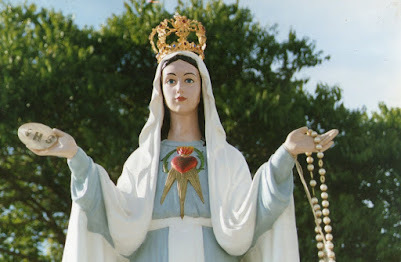 Interestingly, though the vision indeed strongly resembled Our Lady of Lourdes, the rosary that she held was of five decades, not the six decade one described by St. Bernadette. A field of white roses suddenly appeared below the Lady and surrounding it was a white picket fence; three of the boards were loose. The lady looked at Matus and pointed to where there was a little hammer and some nails. Matus immediately understood that she wanted him to repair the fence. Unquestioningly, he bent down and set to work. Upon completion, the lady seemed pleased. She then smiled at Matus, held out her arm and gently shook the rosary she was holding. He knew that she was asking him to pray the rosary – only Matus had never learned that special prayer of Our Lady. Before his embarrassment overtook him, the Lady turned her head in the direction of the tree where her icon stood. Matus followed her glance. Before the pine was a canvas showing a map of the world and below it was a black screen. Repent! Pray for priests and the religious! 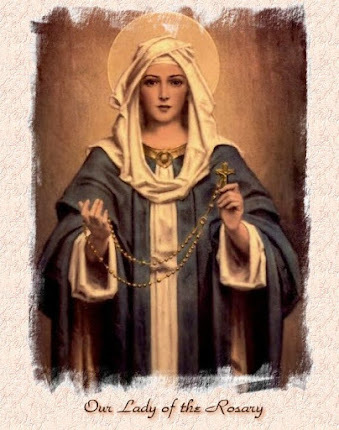 Pray the Rosary! Frightened and confused, Matus looked back at the Lady. She motioned for him to look above her and a flash of lightning cracked the sky in the shape of a triangle. From the hole in the sky, Christ emerged in all His majesty, wearing a long white robe and with a red cape draped over his shoulder. 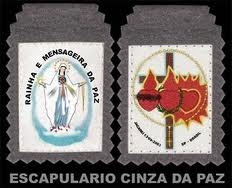 Under his left arm he carried a cross and in the middle of his chest there pulsed an image of his Sacred Heart. Three brilliant rays shot forth from the Heart. Two passed by each side of Matus but center one flashed right through him and he shut his eyes and collapsed to the ground. He awoke to the sound of bells. They were the bells of the nearby church announcing the Angelus – it was noon – he had been there for three hours. He sat up and looked around. The map was gone, as were the flowers and the fence. And the Lady was gone too, but on a rock just below where she had appeared, lay her rosary. He picked it up and began to pray. The Glorious Mysteries formed miraculously on his lips. When Matus finished his rosary, the understanding came to him that the three fence-boards that the Lady had asked him to repair were indicative of the repairs that he needed to make in his own life. 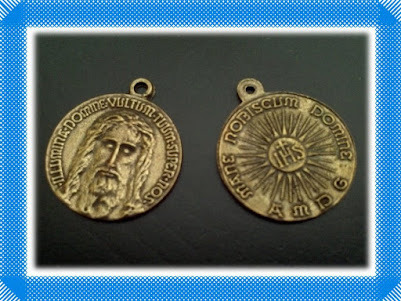 They were his three main shortcomings and he was supposed to fix them through the prayer of the Holy Rosary, the receiving of the Sacraments frequently, and a friendship with all people. He told no one of what he had seen. Matus was visited six more times at Zivcak by the Lady. Each time she appeared the same way, as Our Lady of Lourdes, and each time a vision was given to him in the same way, on a screen with words subtitled below it. Each vision dealt with the sinful condition of the world and the coming of a divine chastisement that could only be put off through prayer and penance. He gave a general description of some of his visions but he also saw specific names, places, and dates which he would keep secret from everyone except the Holy Father. (The Vatican has never made these revelations public, probably as the events are still under review). On the seventh and final appearance on August 14, 1958, she came under the guise of the Immaculate Conception. During the time that Matus was having his visions, people began to notice a marked change in him. They pestered and questioned him until finally he broke his silence and told his story. On September 8th, the feast of the Nativity of Mary, a thousand people accompanied him on a visit to the icon on the hill. There, he surprised his new friends by announcing that in three days, he would be imprisoned. Matus Lasut was moved in and out of various prisons and hospitals by the “committees” in charge of his case. He faced nineteen separate investigations and signed 120 sworn testimonies. During the course of his investigation, he was often subject to twice-daily interrogations. Electrocution. Hypnotism.Chemical cures. After five years, Matus Lasut was finally released from prison but lived under constant surveillance for the rest of his life. Left half-blind and nearly toothless from the “treatments” inflicted upon him, he went right back to returning to his mountain. 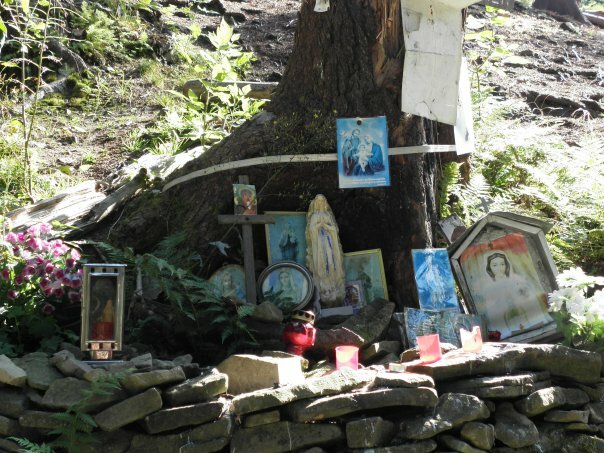 He found that despite attempts by the police to deter pilgrims by cutting down trees and burning images of the Holy Virgin, the site of the apparitions was growing dearer and stronger in the hearts of his countrymen every day. In fact, visitors from other parts of Czechoslovakia began to trickle in to Turzovka and soon they followed by Austrians and Germans and others. Many offered money to Matus but he never accepted a penny, preferring to live out his life in poverty. But the story of Our Lady of Turzovka doesn’t end there. The remainder of the story begins with a man named Jaroslav Zaalenka. He had a dream in which a beautiful lady told him to go up to the mountain (Okruhla) and dig. Not understanding what he was supposed to do, he didn’t follow her directions until after the third night of the same dream. He brought his shovel to the mountain and wandered around looking for a place he should dig. At a loss for guidance, he picked a random place that wasn’t too rocky. No sooner had he begun when the lady from his dream suddenly appeared and spoke to him. “Not here,” she said, “but over there, where you see those ferns.” He walked over to the ferns and set his shovel below the roots. As his foot pushed the shovel into soft ground, the ferns vanished and water began to bubble up. He turned to look back at the lady but she was gone. Six more springs formed on the mountain over the ensuing years when there had never been a single one recorded in its history. Word of miraculous cures began to spread. Nuns, priests, doctors, engineers, and people from all walks of life swore to the healing effects of this water. Lung cancer. Blindness. Paralysis. Soon, upon request, jars of the water were being sent to Rome. The prophecy reportedly made by the visionary and stigmatist Therese Neumann to Slovakian Bishop Karol Kaspar in the 1920’s had apparently been fulfilled: "In a few years, you will have in Slovakia another Lourdes where you will go on pilgrimages." 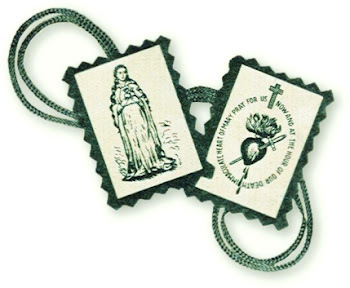 Even the name of Padre Pio was brought into the mix after he wrote in a letter to a Slovakian Jesuit priest, "Turzovka - ít is an authentic apparition. 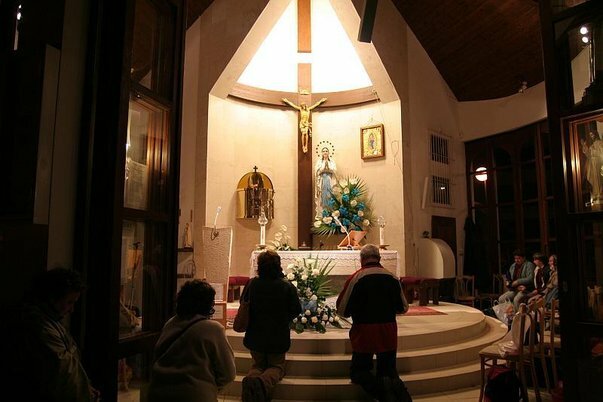 In time, it will become the Slovak Lourdes!" Turzovka grew beyond control. Visions and voices and unexplainable events spread like a contagion among those who visited the site. Perhaps through modern eyes, jaded by the experience of so many hoaxes and false apparitions, we might see the related phenomena as fakeries by hucksters or hallucinations by “groupies.” Yet, looking at each case individually, there seems to be nothing malicious, nothing sinister behind them. 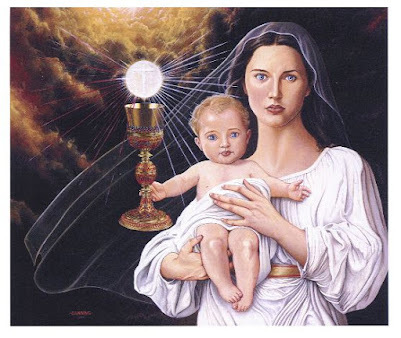 There doesn’t seem to have been an “industry” that profited from the appearance of Our Lady. Nothing but good seems to have come of it. And nothing contrary to the Faith. One of the more tender stories , of typically Slovakian flavor, regards a bus filled with passengers that stopped at Cadca, a village about 10 kilometers from Turzovka. A barefooted woman with a rosary in her belt boarded the bus. “Where are you going?” the driver asked her. “Turzovka,” she replied. The driver calculated the fare and handed her a ticket but the woman said that she had no money to pay for it. One of the passengers offered to pay her fare but the woman smiled at him and said she couldn’t accept his offer because he already had three children at home for whom he must care. The driver, feeling pity for the woman, then offered to pay for her himself. He was taken aback when she told him that she could not accept his help either because although he was not married, she knew that wanted to be. He indeed did need to save every coin for the hard times that he would soon be facing. By this time, the passengers had begun to pay attention. One of them came up with the idea for everyone aboard to each pay a tiny portion of her fare. The lady agreed to this but before she took a seat, someone insisted that she first show her identification as no one had ever seen her in those parts before. The lady looked at the bus driver and announced that her ID was in his pocket. The surprised driver reached into his jacket. All that was there was a holy card picturing the Holy Virgin. The woman disappeared before their eyes. 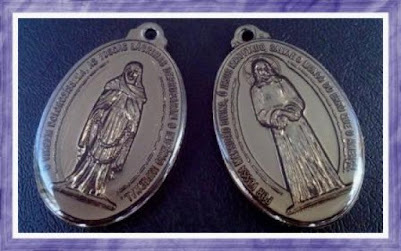 An extensive list of miracles and stories is still being compiled to this day at this “Lourdes of Slovakia.” Perhaps the greatest miracle to occur though, was that Slovakia and its faithful devotion to the Mother of God, survived through decades of relentless persecution to outlast the Soviet Union. After the communists departed, the dream of millions finally came true. 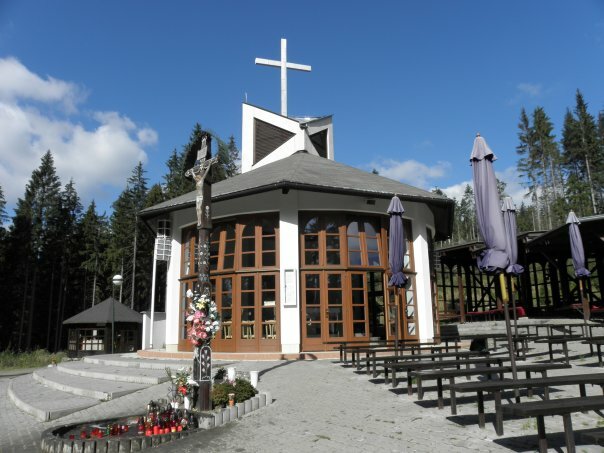 A permanent shrine was finally allowed to be built at the site of the apparitions in 1993. Our Lady, June 1, 1958 “Do penance! 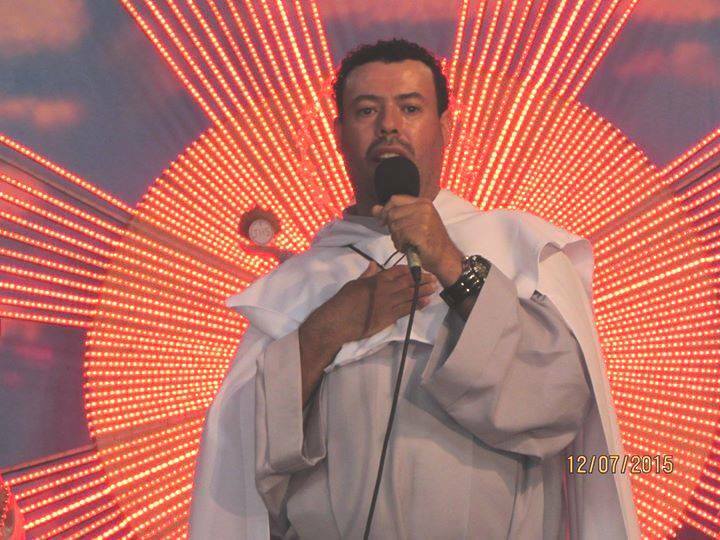 Do penance!” This message appeared in the very first tableaux that was shown Matous during the first apparition. The inscription showed these words, not just once but twice! “As for penance, it must consist above all in abstaining from evil and doing good” Also Our Lady said that penance is not only for sinners but for all. During his three hours of ecstasy on this day Matous was cured of all his sickness including his chronic bronchitis. Vision, June 1, 1958: Matous saw pictorially the increasing invasion of the nations by evil. He also saw a glimpse of heaven towards the end of the apparition and a vision of Jesus on the cross. Our Lady, June 7, 1958: The Tableaux showed the horrible spectacle of the sins of man. These sins surely are repulsive to God. Miraculous images, September 8, 1963: Some people went to Tuzovka and brought water to keep in case of sickness. The water was placed in two bottles. On January 24, 1964 a woman was in pain so they fetched the bottles and found the water was frozen. In the first bottle they saqw the heights of Turzovka and above it a Chalice with a silver cross in the centre. In the second bottle was also shown the heights of Turzovka and above it a clock which showed the time as five minutes before 12 O’Clock. On February 7, 1964 the ice now contained the images of two Chalices with a silver disk inside. Then on February 15, 1964 the Easter Lamb appeared in the ice. On March 5, 1964 the Easter Lamb appeared in the ice. On March 5, 1964 yet other images appeared in the frozen bottles of water. The first was the Immaculate Conception showing Our Lady with Her hands folded and a crown on Her head. 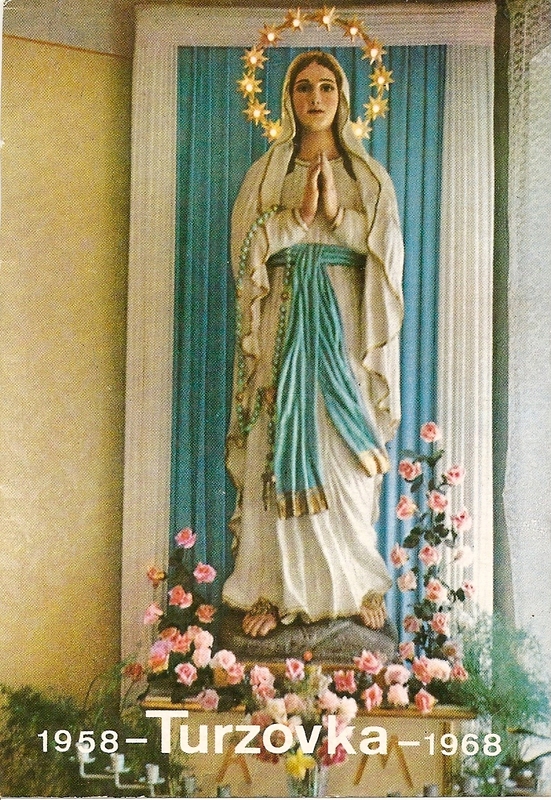 The second showed Our Lady with a radiating heart standing on a pedestal. 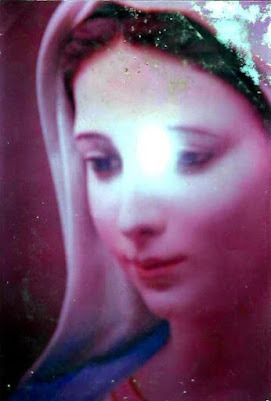 Miraculous images, undated, 1963: A glass of water belonging to Mrs Agnes Koneana was frozen and an image of the Blessed Virgin Mary was exquisitely shown in the ice. This was shown to some officials who just shook their heads. The iced water was allowed to thaw and was refrozen. This time an image of a Chalice with a Host suspended above it appeared in the ice. 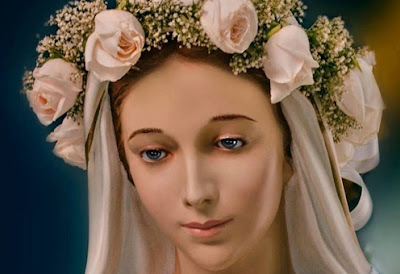 Our Lady, undated, June 1964: There is a beatutiful story reported concerning an exquisitely carved statue of Our Lady of Turzovka which is destined to be set in a prominent place in the new Basilica which is to be built on the mountain of the apparitions. Alois Lasak a retired coal miner who lived in Hlucin some distance from Turzovka felt drawn to Turzovka and would take the bus and visit the shrine at least once a month commencing in 1960. On one such visit in June 1964 Aloid saw blood flow from the Crucified Christ on the cross which had been erected on the spot where the apparitions had occurred. Alois also saw Christ on the cross throw His head back and open His eyes, then bend His head forward and close His eyes again. This happened three times during this vision. The next day Alois had another vision inside his own house. Our Lady appeared to him and commissioned him to carve a statue of Our Lady of Turzovka. She told Alois “What you see is to be done by you. This work, once finished, you will deliver it to the believers. You must not fear, I shall help you. Even the face I shall supply” During this vision Alois was also shown the passion of Christ. The vision lasted four hours and left Alois weak and trembling. He had no experience in carving or sculpting and he was afraid. After talking to his wife he decided to visit the shrine again. When Alois arrived at “U Obrozku” and aged man remarked “Among you is a man who will carve a statue of Our Lady of Turzovka” This man then lead Alois to the cross (the very first cross where Alois had the vision). 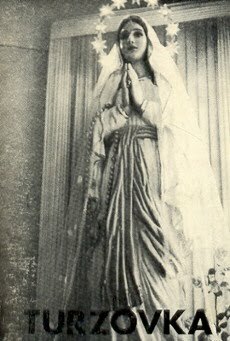 Incidentally in 1958 Our Lady had directed Matous to make a cross from the downed pine tree and erect it on the spot where She had appeared. This was done but the communists burned the cross. The pilgrims erected a new cross and placed the partially burned original cross on the new cross. The new cross was burned and again replaced always preserving the partially burned cross. This happened three separate times. It was to this third new cross that the aged man led Alois. Here the aged man insisted that Alois remove the partially burned cross and carve a small cross and a heart from it, and that these two objects should be placed inside the statue to be carved by Alois. It was done. Someone obtained the wood for the statue, the cross and heart were placed in a cavity dug out inside the wood. After the wood was halved the two halves were glued together and Alois proceeded to carve the statue –a feat which he completed in two months! 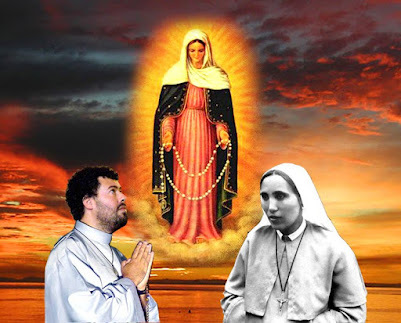 Our Lady and Our Lord, May 1, 1965: A great sign occurred in Turzovka, witnessed by some 1200 pilgrims and vacationers. On two opposite sides of the sky there appeared huge brilliant shrines. These twp shrines then came together in the middle of the sky to form in brilliance a huge heart. 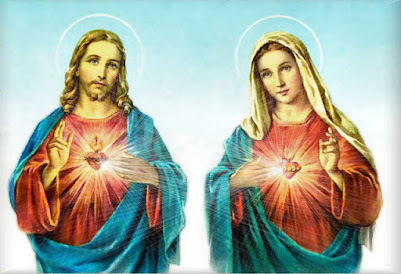 On one side of the heart appeared the Immaculate Conception, while Our Saviour appeared on the other side. In front of Our Saviour was a big red cross. This lasted for ten minutes. People fell to their knees and prayed with great fervour. 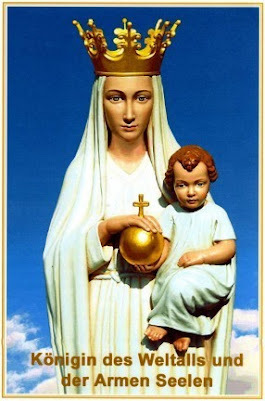 Our Lady, undated: Our Lady told Matous that prayer can hold off the justice of God but such prayer must come from the heart, not proceed only from the intellect and it must not be said absentmindedly. And to the prayer must be added good works. 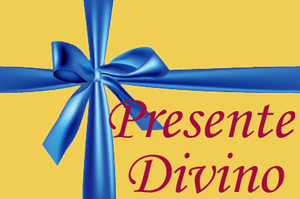 These good works must not consist in a bare distribution of food, clothing or money, but the gifts must be accompanied by encouraging words, a smile and friendly glance. Miracles, undated: The water taken home from the Springs displayed miraculous images after the water had been frozen. Several instances are reported where sacred images appeared in the ice. Then when the ice was metled and refrozen other and different images appeared.